Have you ever felt like your life is segmented into pieces, like you have the work part, the spouse part, and the family part? Sometimes you find a few minutes to devote to the you part and do something you want or need to do. All of these pieces of me require me to change hats, so to speak, and become a different version of me to fit the occasion. There are many days that I feel, as I’m sure you do, that the pieces of me are pulling against each other threatening to pull me apart at the seams. 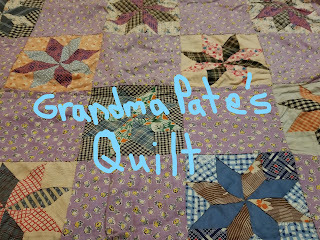 If life is a tapestry, sort of like the quilt-top that my Great-grandma Pate constructed, then the purpose of my life is to put all those pieces of me together in some sort of pattern, utilizing my past and my current relationships, my thoughts, my dreams, and my beliefs to make up the quilt of my life. In my book, Leave Him?, I talk about how I would have never put the patterns and colors together in the way that my great-grandmother did years ago. Anyone who knows me knows that I want things to be matchy- who would dream of wearing navy blue shoes with a black outfit. It even bothers me when my nail polish clashes, after all things must be perfect. My striving for perfection doesn’t stop with my outer appearance- I naturally hold that standard (one I can never measure up to) for all of the things in my life and have to consciously fight to allow myself the grace to be less than perfect. A half-century of failed attempts at perfection helps to push through to an adjustment of standards. I struggled with a way to end my memoir last year, because I have not come close to figuring life out and summing it up in a ‘they lived happily ever after’ sort of way. The quilt of my life contains many pieces of fabric that I have had to learn to love and embrace, and there are still days when I feel it is coming apart at the seams. If you decide to read my book you will not find a tidy, how to live manual, but instead you will find stories that illustrate a journey, sometimes sloppy, that is both distinctive and universal. Most of all my desire when reading my book is that you would feel that it is okay to not be okay as one of my favorite Christian music singers, Plumb says. If you struggle with matchy perfectionism or feeling like you have blown it maybe this is the book for you. Attention Book Clubs! Message me for discounted prices on multiple copies with the contact person receiving a free copy!